Mac mini® has been around since 2005, and has been a favorite with business customers as a great general purpose computer. In recent years, however, the Mac mini has taken a back seat to other Apple® products and hasn’t experienced a major update in quite some time. Until now, that is. 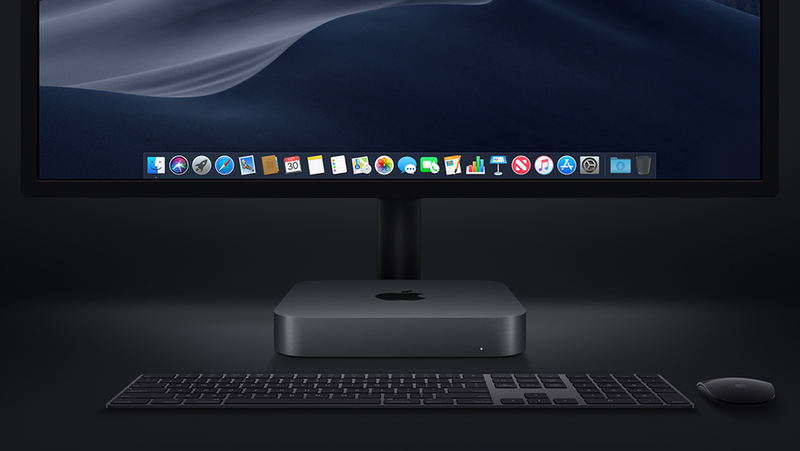 Mac mini is back on our radar, and it’s back with a vengeance. Reintroduced two weeks ago, this powerful new Mac mini is aimed squarely (get it?) at professional users. Although it retains the same diminutive form factor as recent iterations — 7.7 inches square and 1.4 inches — there is no need to kick Mac mini's tires this time around. This box has guts. The new mini offers huge performance gains over previous versions, starting with new eighth-generation 6-core and quad-core Intel processors. In fact, with the top-of-the-line 3.2 GHz 6-core i7 processor, Apple claims up to five times the performance of the previous (2014) Mac mini and up to 60% speedier graphics performance thanks to the integrated Intel UHD Graphics 630. That, Apple says, is industrial-strength power. Packing this much firepower into the same small space gray enclosure required an all-new thermal architecture — including all flash storage, a bigger fan, expanded vents and a redesigned power supply. Mac mini doesn’t lack for RAM or storage, either. It features high-performance 2666MHz DDR4 SO-DIMM memory and 8GB of RAM onboard, but can be configured up to 64GB to run much heavier workloads. And with its all-flash PCle-based storage — up to four times the read speeds of previous flash options — users can load massive files and launch apps faster than ever. While the Mac mini’s base 128GB of SSD storage might be adequate if all your data is stored on a NAS device, you can upgrade from 256GB all the way up to 2TB — at a significant cost, of course. This additional storage is automatically encrypted thanks to the device’s T2 security chip, which also speeds HEVC video transcoding. And Mac mini can connect your tech like never before. While Apple’s notebooks have recently been shedding ports, Mac mini has bucked the trend. It features four Thunderbolt 3 ports, an HDMI 2.0 port, two USB-A ports, an audio jack and a Gigabit Ethernet jack with 10 Gigabit Ethernet as an option. Thanks to the Thunderbolt 3 and HDMI ports, you can connect either a 5K display and a 4K display, or three 4K displays. Mac mini starts at $799 for the 3.6 GHz 4-core Intel Core i3, 8 GB of RAM and 128 GB of storage. If you are among those CranstonIT customers who have long favored Mac mini for general business use, now’s the time to start budgeting for this new powerhouse.